Thank you to all who have taken up the challenge. So far our total stands around £16,000 and is still rising!! All of the money raised goes to Cancer Research UK….. The challenge was in memory of Sonya’s dad who lost his fight with Cancer in June 2013. From diagnosis he deteriorated rapidly, passing away only 6 weeks later on June 10th. The final event that James attended was Race For Life hence the challenge will begin from the same venue after the Belfast Race For Life this year on June 1st. We all know someone who has suffered as a result of Cancer and we feel helpless whilst watching them struggle. You can help by raising money to assist in research to understand Cancer, how to treat it and how to beat it. 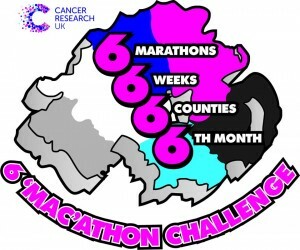 If you feel like donating to the 6'Mac'athon cause there is a Just Giving donation page set up. Click on the link below to visit the page.